With increasing attention directed toward bio/pharmaceutical product safety, the importance of screening for trace metal contamination is becoming more important. Eurofins BioPharma Product Testing offers an array of testing services for a variety of applications that contribute to product integrity, including drug substance and raw materials assays, cleaning validation, media screening, extractable/leachable studies and final product assay. Our expertise and instrumentation enable analysts to offer a wide range of assays according to pharmacopeias (USP, EP, BP, JP, etc. ), including support for the launch of USP <233> chapter for metals testing, as well as other customer specifications. Capabilities are available using ICP-MS, ICP-OES, Flame AA, Graphite Furnace AA and Cold Vapor AA (mercury). 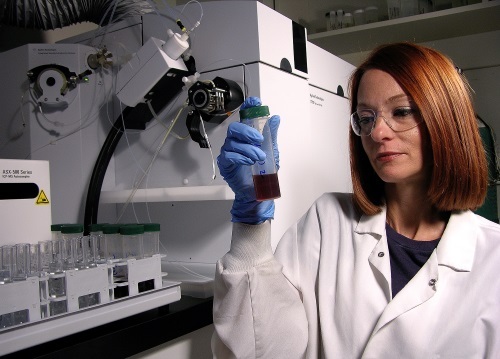 We have more than 15 years of experience developing and executing methods for trace metals analysis, using modern quantitative technology for pharmaceuticals. Our Metals Team has the expertise to troubleshoot complex sample matrices and method challenges. Our on-site pharmacopeia liaison will contact USP and EP for clarification. Our regulatory experience enables the team to ask the right questions and determine the most appropriate testing approach, delivering service that meets clients' needs-whether a non-GMP general screening method or a validated GMP analysis that will withstand regulatory review. Comprehensive instrument capacity allows for rapid turnaround time. In order to develop the best approach, the Metals Team begins by determining whether the application requires validated or non-validated methods. A fully validated approach may require multiple methods, depending on the material and metals. Define need for a general screening method vs. specific elements of interest. Establish material specification limits as applicable. 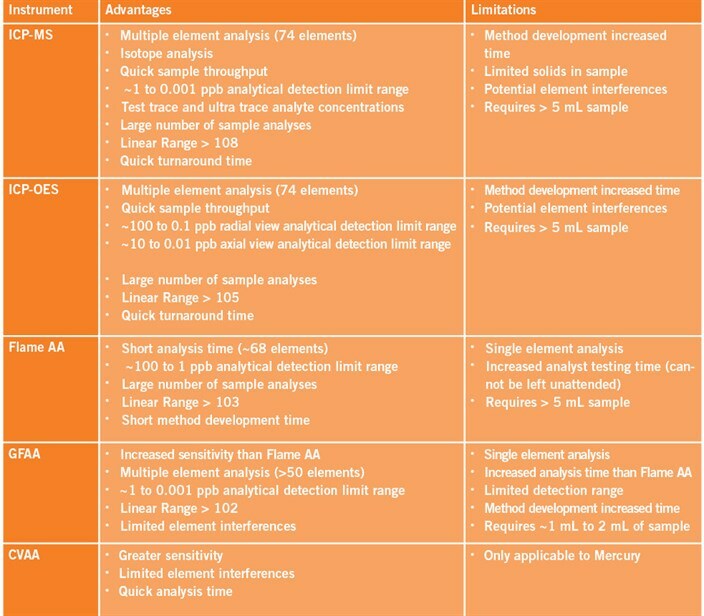 The following matrix will help determine the instrumentation that best meets testing needs and provide general instrument performance guidelines, which may vary by method. For example, sensitivity limits are dependent on sample digestion approach, sample mass and instrument wavelength.